MGM and William Hill both have plans to build sportsbooks in New Jersey. MGM planning to build sports book at Borgata in Atlantic City. William Hill planning to add standalone sports book to Monmouth Park. New Jersey is revving up for expanded legalization of sports betting. 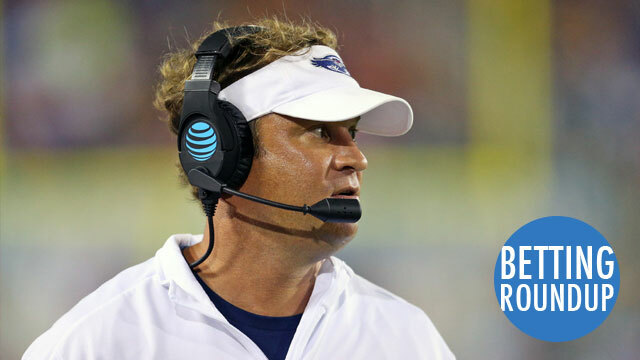 Last week, FAU football coach Lane Kiffin referenced the point spread in a tweet after his team took an intentional safety at the end of the game which affected bet outcomes. Florida Atlantic coach Lane Kiffin said he was joking Friday night when he tweeted about a late intentional safety affecting the betting result in the Owls’ victory over Marshall. Florida Atlantic, which closed as a 6.5-point favorite, had a 30-23 lead with 14 seconds remaining when Kiffin opted to concede a safety rather than risking a blocked punt deep inside the Owls’ territory. He took to Twitter after the game and joked about the Owls not covering the spread with their 30-25 victory. Last week, DraftKings CEO Jason Robins said his company will “weigh options” on whether or not to become a sportsbook if sports betting becomes legal in the United States. Both companies sent representatives to the Global Gaming Expo — the world’s largest gaming conference — in Las Vegas last month. And while that had something to do with their DFS products, it’s foolish to think that’s the only reason either of them was there. There are a lot of “ifs” about the legalization of sports betting. And there are plenty of reasons why DFS sites will find it challenging to become sportsbooks in the short term, if sports wagering becomes legal. But they also have some advantages. The price of Bitcoin continues to climb and briefly jumped more than 11 percent after Square announced it was testing the currency. Bitcoin has again recovered quickly from a sharp drop. The digital currency briefly surged more than 11 percent Wednesday to a high of $7,336.80 , according to CoinDesk. That’s within 10 percent of its record high of $7,879.06 hit last Wednesday. Bitcoin had fallen 30 percent below that record over the weekend amid controversy over the digital currency’s future.